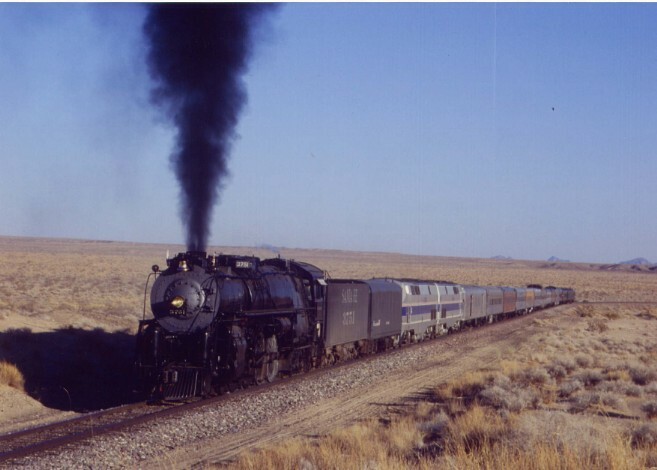 In this story we will look at all the train engines that have pulled my excursion trains through the years. 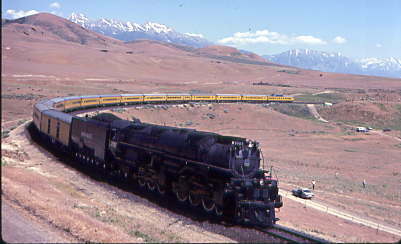 My first excursion was pulled by the Union Pacific Challenger on its first excursion trip from Salt Lake City to Provo on 6/26/1982. 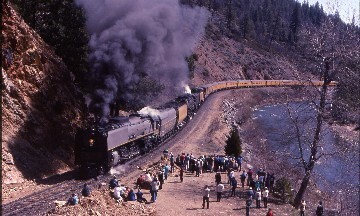 The first McCloud Steam Trip was from McCloud to Hambone behind the McCloud 25 on 9/9/1983. 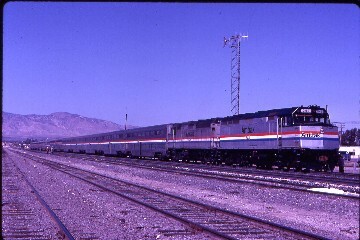 The first train trip over the Southern Pacific Palmdale Cutoff using the Sunset Limited equipment ran from Los Angeles to Mojave had Amtrak 242 on the point on 10/23/1983. 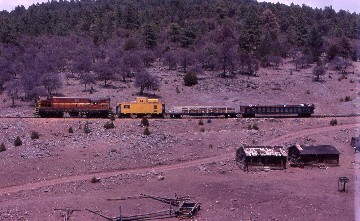 My First Mexican Train Ride was the Pacific Southwest Railroad Museum Puerto Penasco Trip from Mexicali to Puerto Penasco behind Sonora Baja California GP-40-2 2110 on 4/17/1984 . 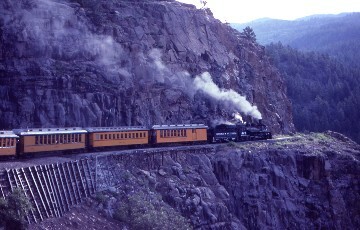 I fired on the Sumpter Valley Railroad working the W.H. 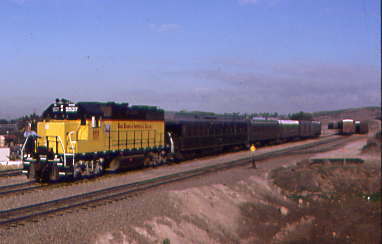 Eccles on 8/25/1984. 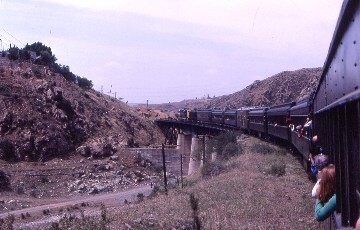 I rode behind the Southern Pacific Daylight 4449 on a two day trip from Phoenix to Los Angeles 6/16-17/1984. 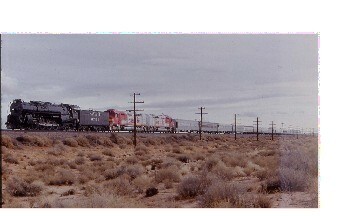 The Pacific Railroad Society Desert Scout ran from Los Angeles to Barstow behind Amtrak 286 on 11/3/1984. 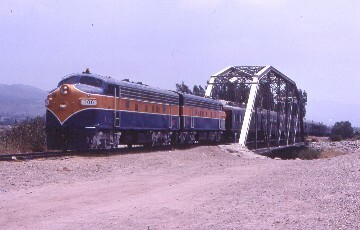 The Pacific Railroad Society Cushenbury Caravan ran from Los Angeles to Cushenbury behind Amtrak 214 seen at Riverside on 5/4/1985. 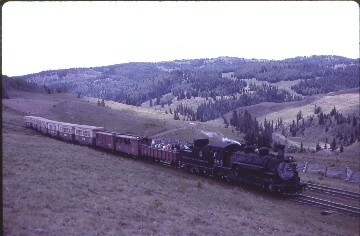 The Cumbres and Toltec Railroad K-36 pulled me from Chama to Antonio on 8/1/1985. 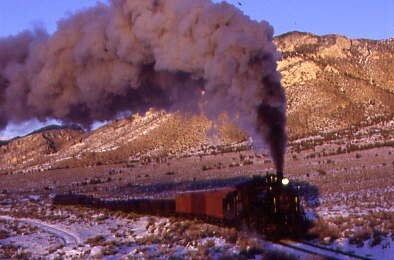 Here at Osier is the Antonio train arriving. 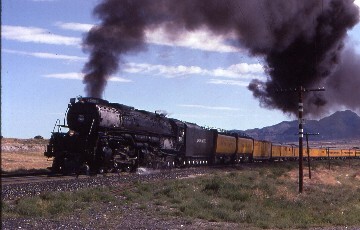 The Durango and Silverton train had K28 473 pulling my train to Silverton on 8/2/1985. 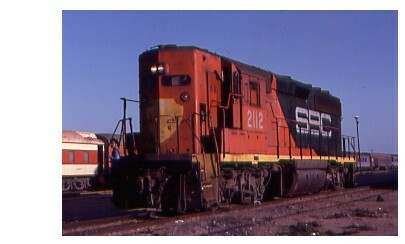 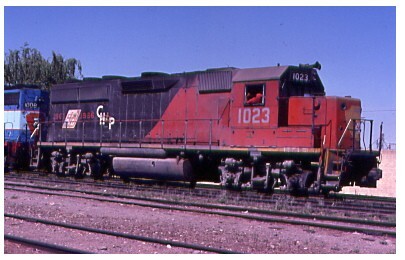 My second Pacific Southwest Railroad Museum Puerto Penasco Trip had Sonora Baja California GP-40-2 2110 on 4/5/1986. 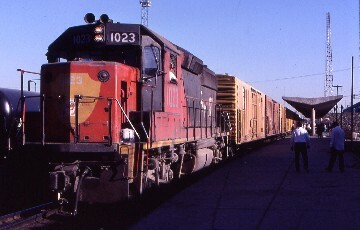 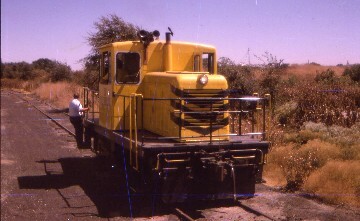 My third Pacific Southwest Railroad Museum Puerto Penasco Trip Sonora Baja California GP-40-2 2110 on 11/5/1986. 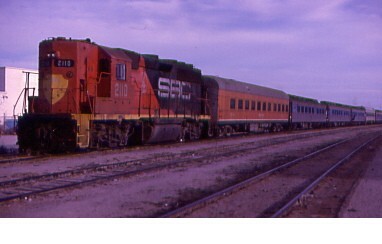 My final Pacific Southwest Railroad Museum Puerto Penasco Trip Sonora Baja California GP-40-2 2112 on 4/4/1987. 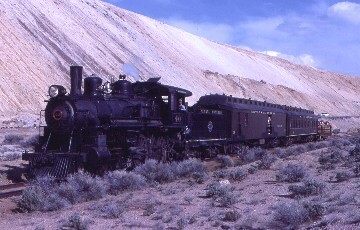 Nevada Northern 4-6-0 40 pulled the Ghost Train of East Ely at Copper Flats on 5/23/1987. 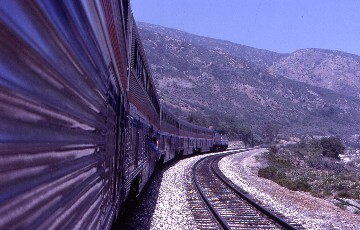 Jeff Hartmann and I rode the first trip ever here. 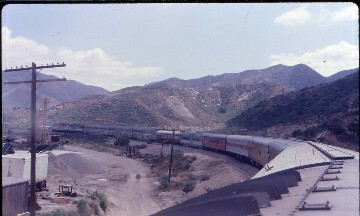 The Pacific Railroad Society Mojave Circle ran out through Soledad Canyon and back through Cajon Pass on the Palmdale Cutoff with Amtrak 250 on the point on 4/17/1988. 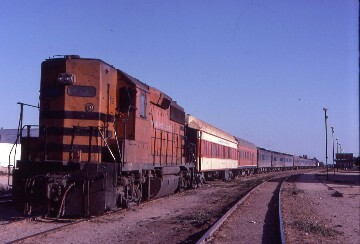 San Diego, Arizona and Eastern ran a train from Campo over the entire Tijuana and Tecate Railroad then up the Trolley Line into San Diego with the San Diego Imperial Valley GP-9 5911 on the point on 4/30/1988. 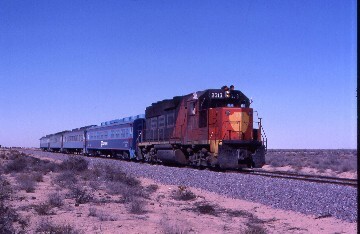 I rode the Chihuahua Pacific Mixed Train 32 behind the CHP 1023 from Cuidad Juarez to Neuvo Casa Grande on 5/13/1988. 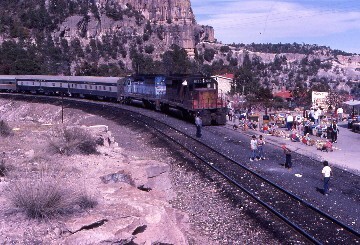 The next day we rode a special train from Neuvo Casa Grande to Cumbres behind the NdeM 905 on 5/14/1988. 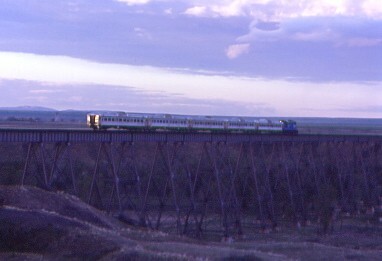 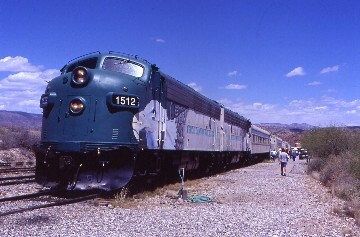 We rode the last train ever across the Bosque de Chihuahua behind Bosque de Chihuahua H-16-44 1000 on 5/14/1988. 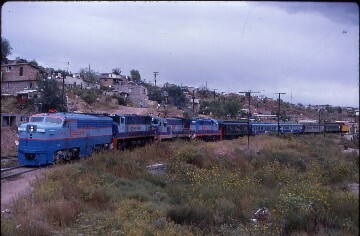 The final mile of the Destination Nacozari 1988 we had the FNM PA1 19 on the point back into Nogales in 9/10/1988. 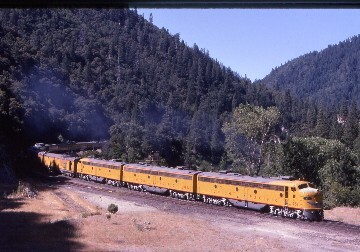 Union Pacific 844 and 3985 took me double heading down the Feather River Canyon from Portola to Sacramento on 4/21/1991. 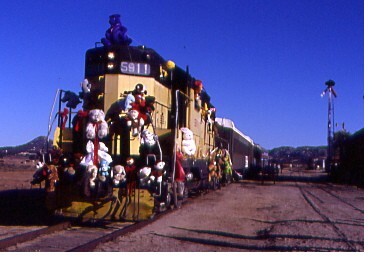 Santa Fe 3751 took me from Barstow to Bakersfield and around the Tehachapi Loop on 12/28/1991. 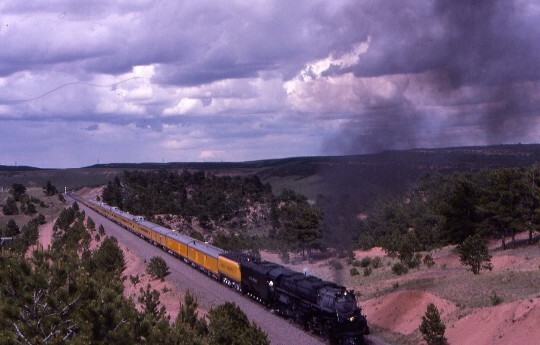 Union Pacific 3985 took me from Cheyenne to Laramie on my first ever Sherman Hill Trip on 6/28/1992 on a Union Pacific Historical Society Trip. 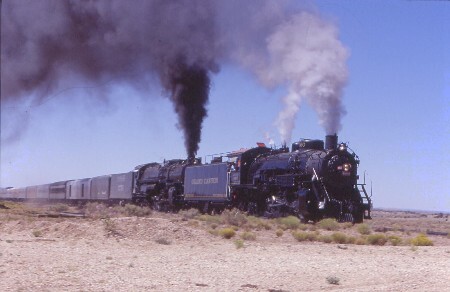 The next day I rode the Wyoming and Colorado Railroad with their FP-7 1512 leading the train from Laramie to Fox Park on 6/29/1992. 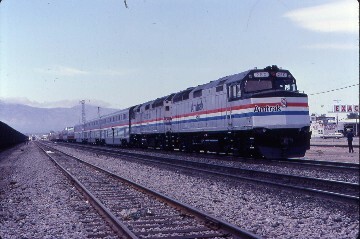 I rode the Union Pacific 3985 from Salt Lake City to San Jose from 7/14-19/1992. 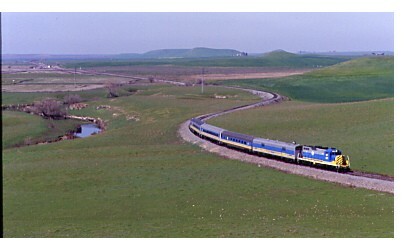 Here are the best photo runbys from each day of these trips. 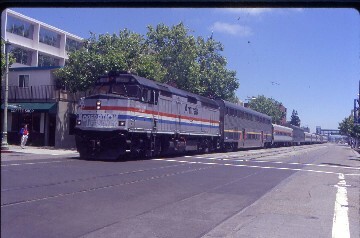 At the NRHS 1992 San Jose Convention I rode the City of Oakland behind the Union Pacific 3985 on 7/23/1992 seen here in downtown Oakland. 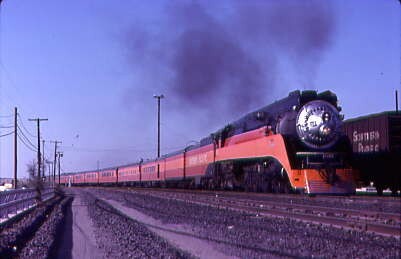 Later that same afternoon I rode the City of San Francisco behind the Southern Pacific 2472 on 7/23/1992. 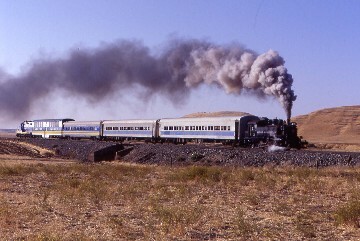 Due to poor train handling by the CHP on my Bananafish Tours Trip 4 we were ran as a special train instead of being put on the rear of the regular passenger train. 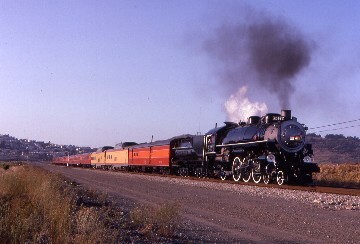 On the CHP portion we were pulled by the NdeM SD-40-2 8780 and 8733 seen at Divisadero on 12/30/1901. 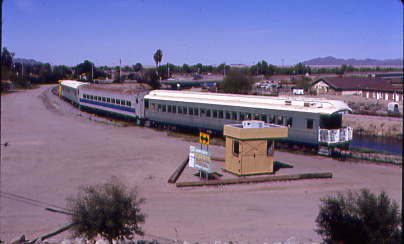 The next day on the Sonara Baja California we were put into the siding for SBC Tren 2 as it raced through Lopez Collada in the middle of the Altar Desert on December 31, 1990. 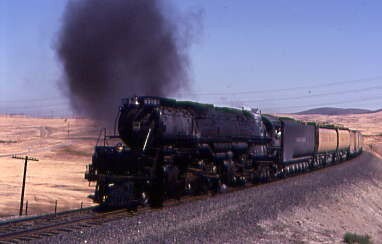 I rode both behind the Great Western 2-8-0 51 and Fillmore and Western F7A 100 on 7/3/1993. 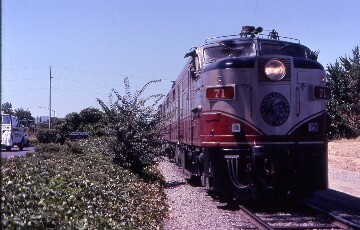 Napa Valley Wine Train Alco MLW/FPA-4 71 took me on the brunch train on 7/29/1993. 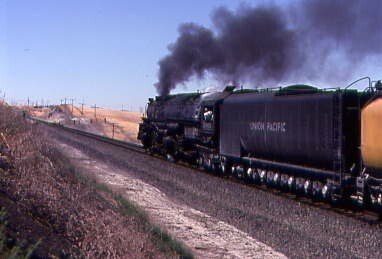 Southern Pacific 2472 took me from Oakland to Tracy and onto Lathrop on 7/30/1993. 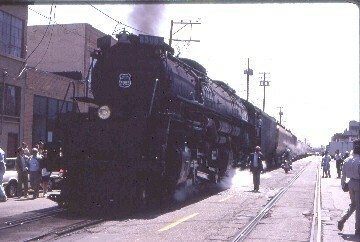 Southern Pacific 2472 took me from San Luis Obispo to a round trip to Tangier on 5/7/1994. 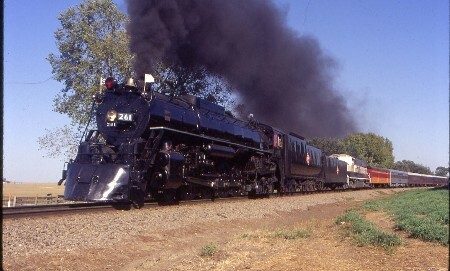 Union Pacific E9a 949 took me from Oroville to Westwood on 7/10/1994. 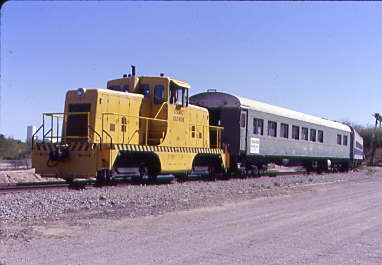 From the Orange Empire Railway Museum I rode from Perris to Hemet behind the RSD-1 US DOT 015 on 11/3/1994. 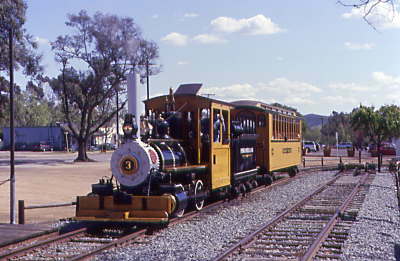 I got sober on January 18, 1995. 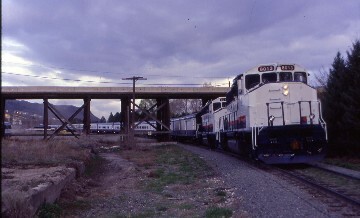 I rode the Yolo Shortline behind their 44 Toner 50 on the Clarksburg Branch on 5/13/1995. 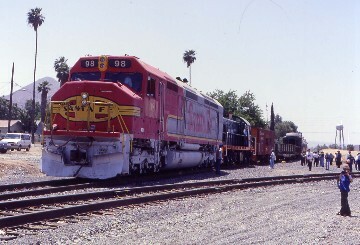 I rode a second trip San Ysidro to Tecate behind the SD&IV GP-38 5537 on 2/24/1996. 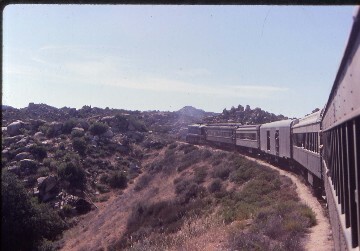 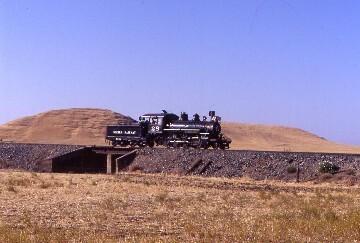 I rode the Pacific Southwestern Railroad Museum trip called Jacumba and Beyond behind the SD&A MRS-1 1809 on 4/26/1997. 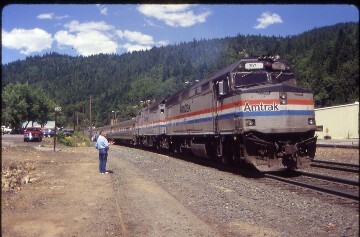 I rode the Mt Shasta Daylight behind the Amtrak 382 from Sacramento to Black Butte on 6/20/1998. 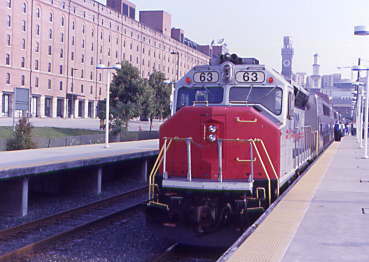 I rode my first Milwaukee Road 261 Trip, a three day trip from North Kansas City to Minneapolis Jct, on 9/11-13/1998. 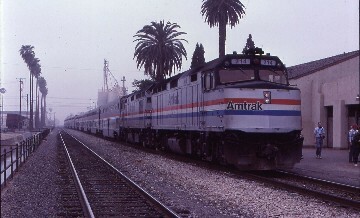 At the NRHS 1999 Convention in Sacramento Amtrak 231 took me on both on the Franklin Canyon Special 6/22/1999 and the West Coast on June 24,1999. 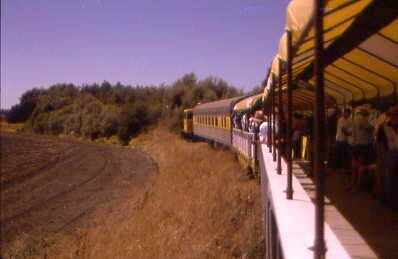 At the NRHS 1999 Convention in Sacramento Union Pacific 844 took us on the City of Tehama from Sacramento to Tehama on 6/23/1999. 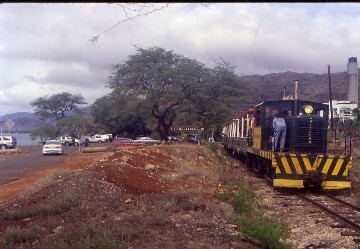 For my 50th State Train ride on the Hawaiian Railway Society I rode behind 423, a 45 ton narrow gauge Whitcomb diesel-electric locomotive, on 11/12/2000. 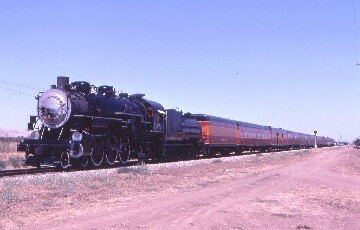 Grand Canyon Railroad FPA-4 6776 took me from Williams to the Grand Canyon on February 9, 2001. 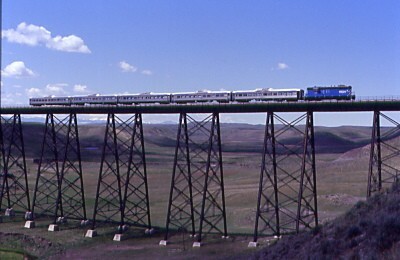 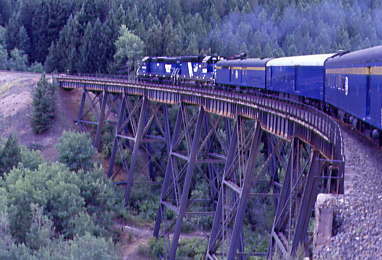 I rode the Rocky Mountaineer behind the GP-40-3 8013 on 4/17-20/2001. 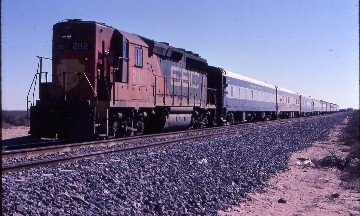 I took the a trip on the Yuma Valley Railroad behind the United States Marine Corps 1975 built GE center cab 152405, on 4/17/2001. 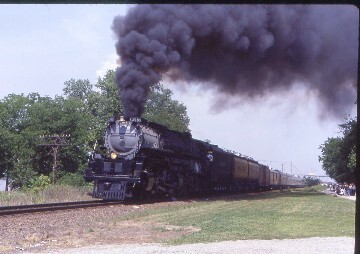 The NRHS 2001 St Louis Convention Union Pacific 3985 took me from St Louis to Gorham, IL on 6/19/2001. 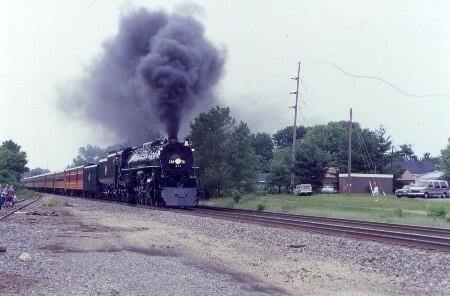 The NRHS 2001 St Louis Convention Frisco 1522 took me on two trips, one to West Quincy on 621/2001 and a trip to Newburg on 6/23/2001. 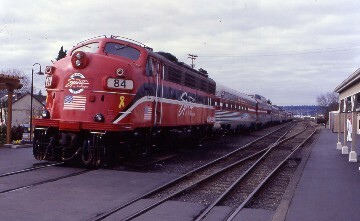 I rode the Spirit of Washington Dinner Train behind the F9As 84 and 82 on 4/31/2002. 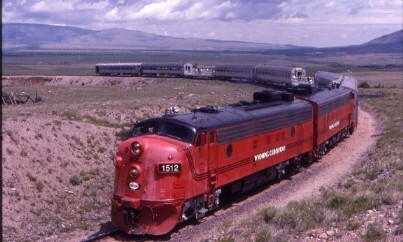 I rode the Verde Canyon Railroad FP-7's 1510 & 1510 on 4/20/2002. 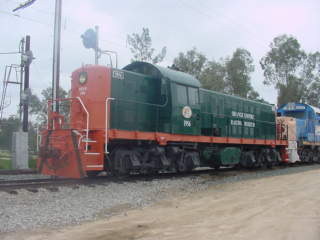 Santa Fe FP45 took me from Perris to Highgrove on 5/11/2002. 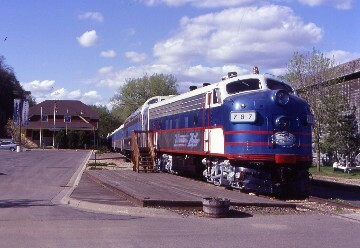 I rode the Minnesota Zephyr Dinner Train behind the F7A 787 and 788 on 5/17/2002 . 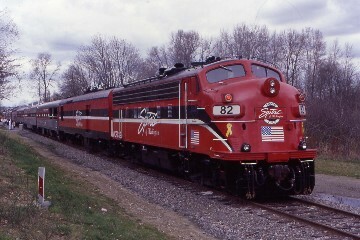 I rode the Milwaukee Road 261 from Minneapolis to Duluth on 5/18/2002. 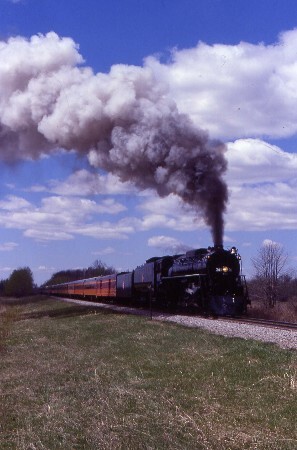 I rode the Dinner Train from Duluth to Marbles behind the DM&IR 193 subbing for the Milwaukee Road 261 on 5/18/2002. 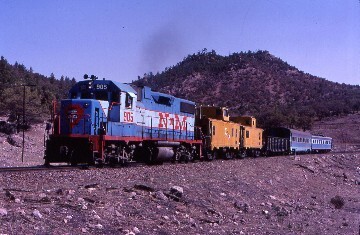 The NRHS 2002 Grand Canyon Convention gave me a chance to ride behind the Santa Fe 3751, Grand Canyon 4960 and 18 on 8/24/2002. 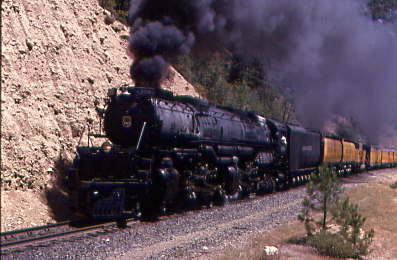 Santa Fe 3751 took me home from the NRHS 2002 Grand Canyon Convention via the Peavine Line and Arizona and California from Williams to Los Angeles on 8/25-26/2002. 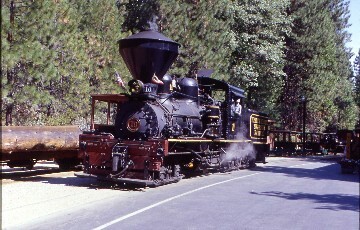 I rode the Yosemite Mountain Sugar Pine Railroad behind the three truck Shay 10 on 8/30/2002. 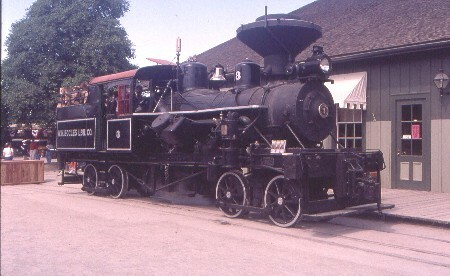 At the Iron Horse Roundup 2002 I rode behind the Quincy 2-6-2T 2 on 8/31/2002. 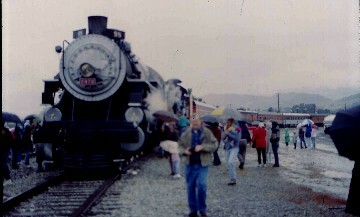 At the Iron Horse Roundup 2002 I rode behind the Sierra 2-8-0 28 on 8/31/2002. 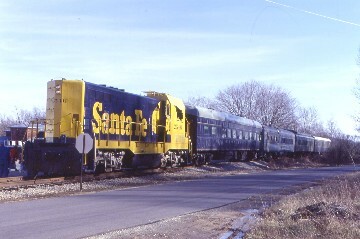 At the Kentucky Railroad Museum I rode behind Santa Fe CF-7 2546 on 12/28/2002. 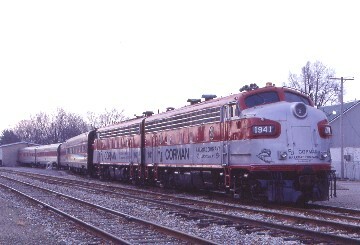 I rode My Old Kentucky Dinner Train behind RJ Coram FP-7A's 1941 and 1940 on 12/28/2002. 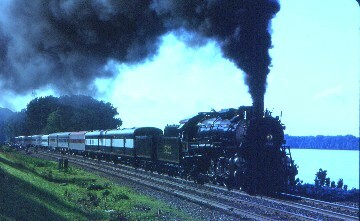 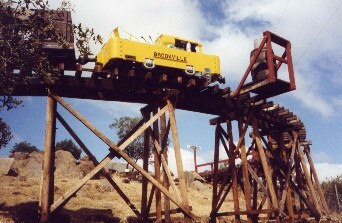 I rode behind the 2.5 ton Brookville Locomotive on Descanso, Alpine & Pacific on 4/5/2003. 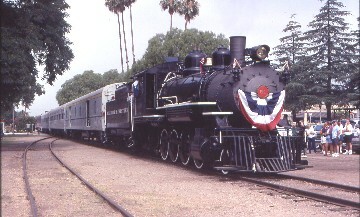 I rode the Poway Midland Railroad behind the Engine 0-4-0 3 that was built by Baldwin in 1907 on 4/5/2003. 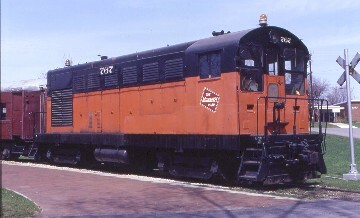 At the National Railroad Museum I rode behind the Milwaukee Road H-10-44 767 on 5/2/2003. 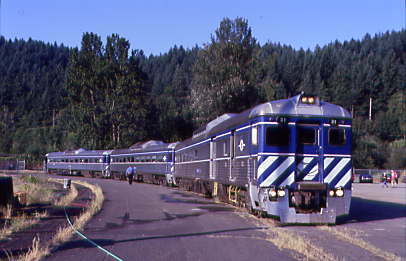 I rode the Lewis and Clark Explorer 998 with RDCs RDC's 31, 11 and 10 on 6/15/2003. 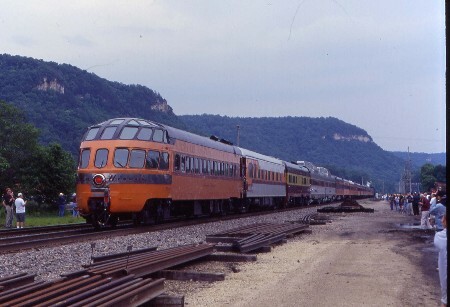 Milwaukee Road 261 took me on a two day trip from Minneapolis to Chicago over the old CB&Q on 6/19-20/2003. 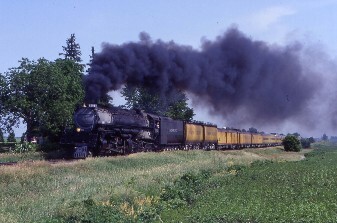 Union Pacific 3985 took me from St Paul to Kansas City on a two day trip on 6/21-22/2003. 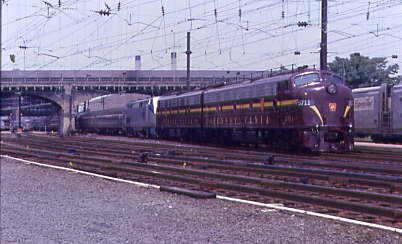 At the 2003 NRHS Baltimore Convention I rode the Harrisburg Circle behind the Pennsylvania Railroad E-8s 5711 and 5809 on 7/5/2003. 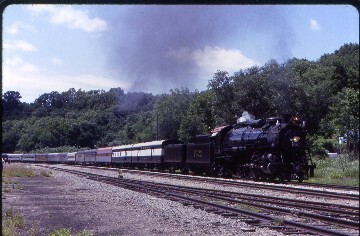 At the 2003 NRHS Baltimore Convention I rode the NRHS Blue Mountain Limited Baltimore to New Oxford on 7/6/2003. 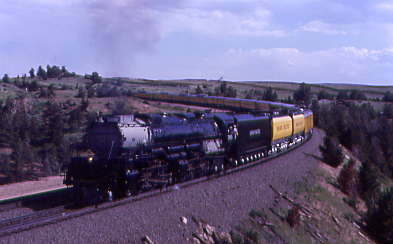 A Union Pacific 3985 trip to Yoder became at trip to Laramie from Cheyenne instead after the UP parked coal trains on that line to Yoder on 7/12/ 2003. 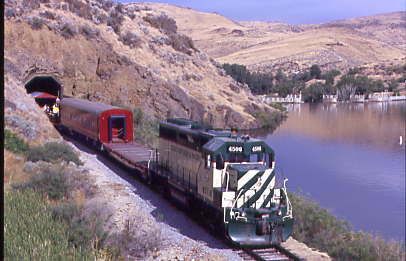 I rode the Southern Appalachia Railway Museum Idaho Cascadian Passenger Train from Payette to Cascade behind the Idaho, Pacific & Northern GP-40 on 8/8/2003. 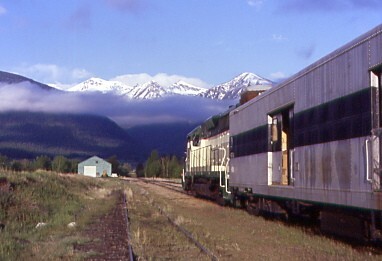 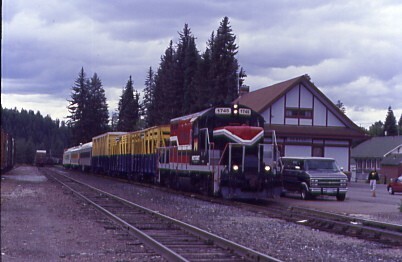 I did the four day Montana Daylight Trip from Livingston to Sandpoint and back behind Montana Rail Link SD-19-1s 651 and 652 on 8/22-26/2003. 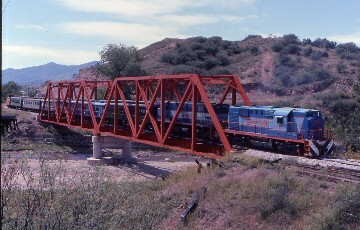 I did the Three Kings Train to Tecate behind Carrizo Gorge GP-9 5911 from Campo to Tecate on 1/11/2004. 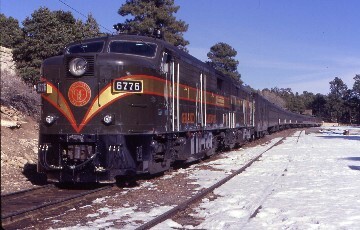 I rode Sierra Railroad GP-9 46 on a post Winterrail Photo Train on 4/13/2004. 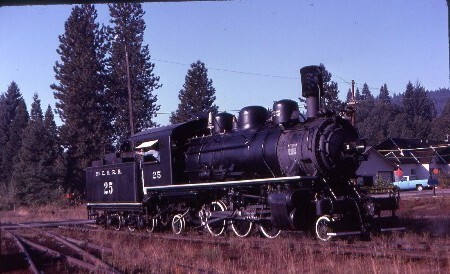 I rode the Southern Appalachia Railway Museum Eagle Cap Limited on the Wallowa-Union Railroad Authority behind the Wallowa Union Railroad Authority GP-35 4508 on 5/22/2004. 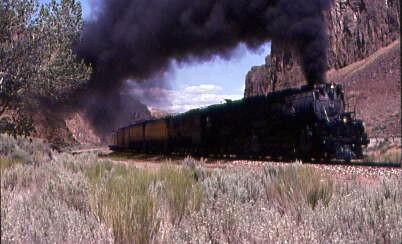 I rode the Southern Appalachia Railway Museum Pend Orielle Hiawatha on the Pend Orielle Valley Railroad behind the Pend Orielle Valley Railroad GP-10 1745 on 5/23/2004. 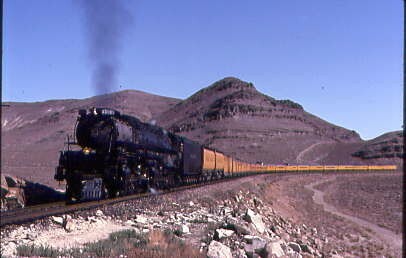 I rode the Southern Appalachia Railway Museum Central Montana Rail Judith Basin Dinner Train on the 5/24/2004 and Jawbone Express Passenger Train on May 25, 2004 behind the Central Montana GP-9 1824.